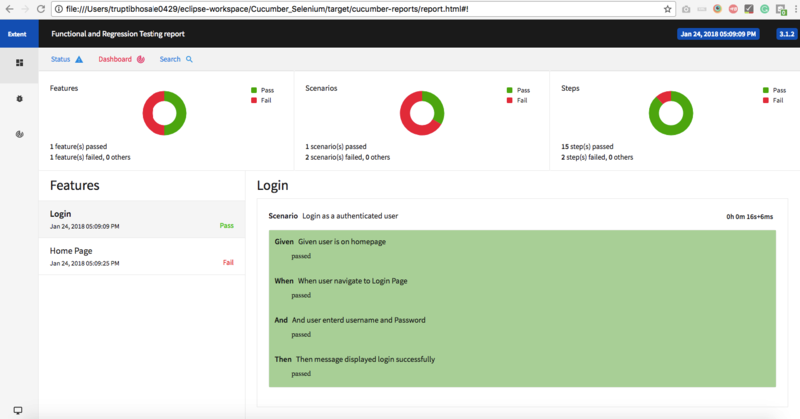 Cucumber is an open source tool that supports Behavior Driven Development (BDD) framework. It provides the facility to write tests in a human readable language called Gherkin. 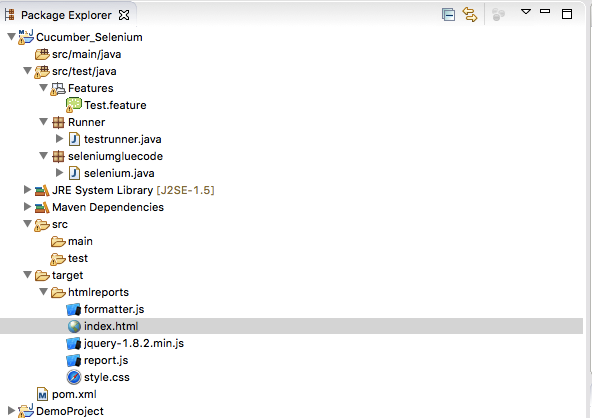 The Selenium-Cucumber framework supports programming languages such as Perl, PHP, Python, .NET, Java, etc. 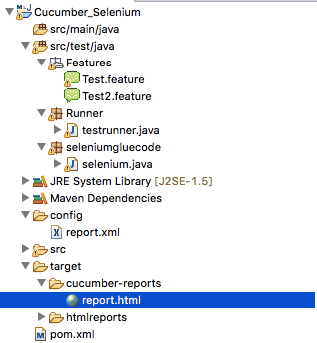 In this blog, we will focus on how to set up Selenium with Cucumber using Maven, and also learn to write feature files using Gherkin, execution, and generating HTML reports. On the Available Software popup, enter the URL “http://cucumber.github.com/cucumber-eclipse/update-site” in the Work with field. 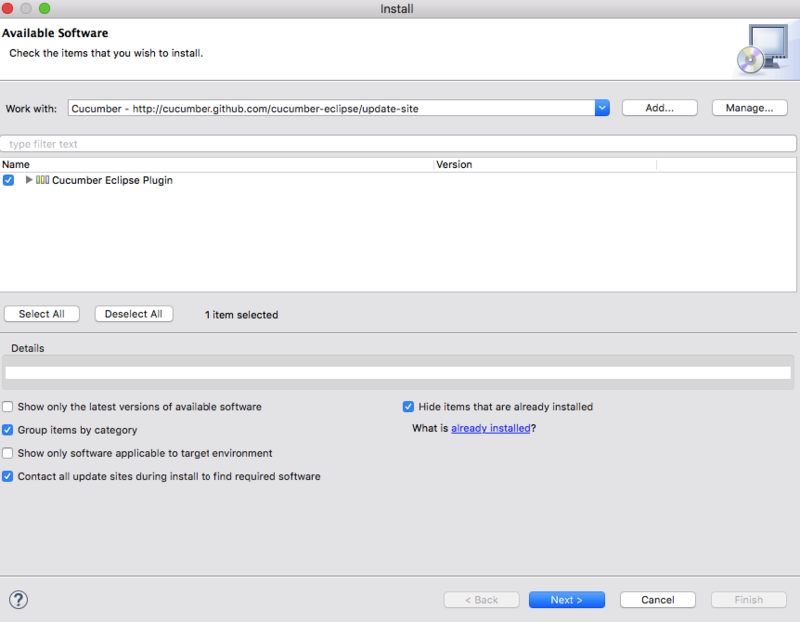 You will see “Cucumber Eclipse Plugin” displayed in the filter; select the checkbox and click Next, and you will navigate to the Install Details popup. Click Next to proceed further. Accept the license in the Review License pop-up and click Finish. Maven is a automation build tool and is widely used for Java projects. It is mainly used in managing dependencies through pom.xml. Suppose you want to upgrade the JAR files and in your project you are using version 1.25 for Cucumber-Java dependency. You need to upgrade to the latest version. 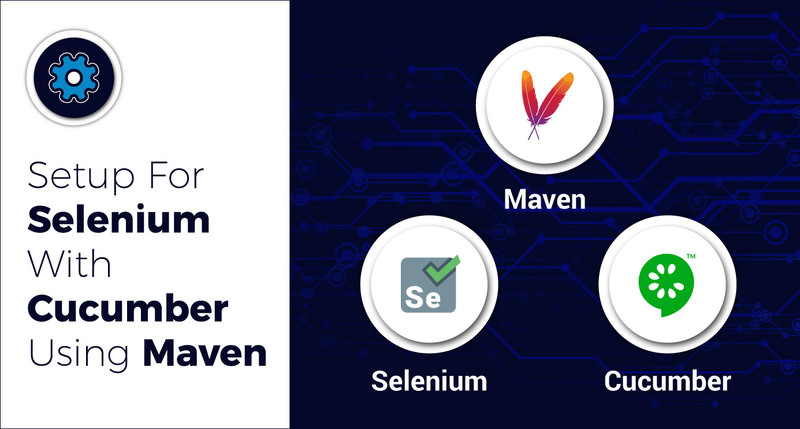 With the use of Maven, it’s easy to upgrade the version. 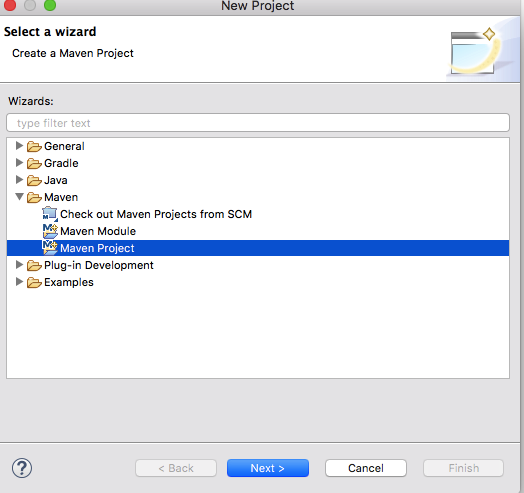 Step 1: To create a Maven Project in Eclipse, click on New → Project → In the wizard, select Maven Project. 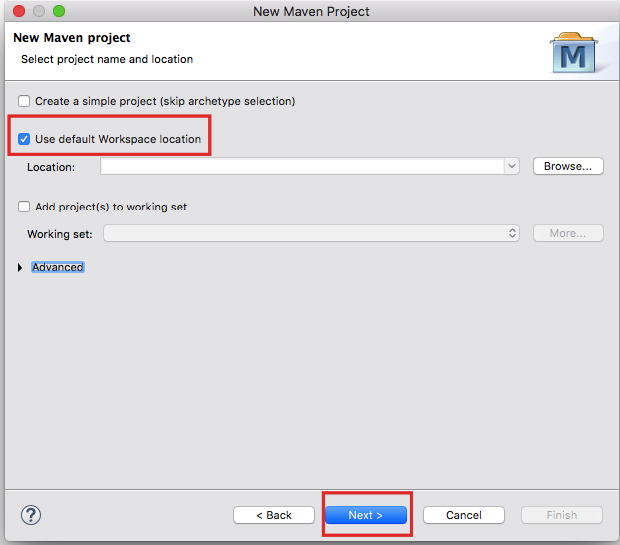 Step 2: On the new Maven Project pop-up, select the checkbox to create your project at the default location OR you can also browse and set a new location of your choice. Click on Next to proceed. 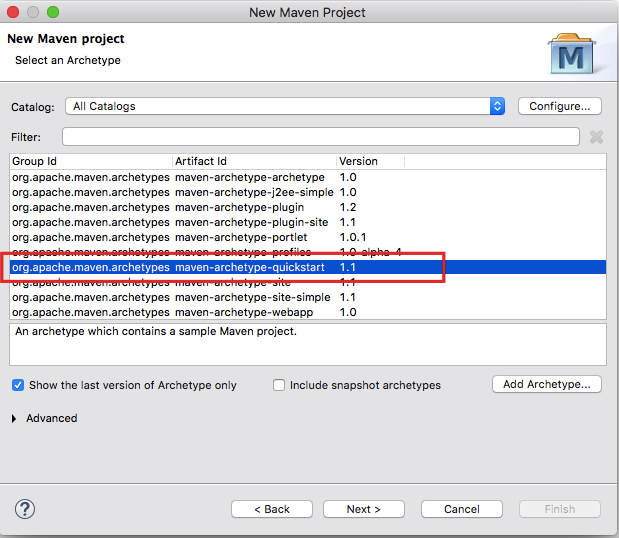 Step 3: On the next screen, by default the Group ID and Artifact ID org.apache.maven.archetypes maven-archetypes-quickstart 1.1 is selected. Click on Next to proceed. Step 4: In the next screen, you will have to mention a Group ID and Artifact ID of your own choice; this is the name of your Maven project. 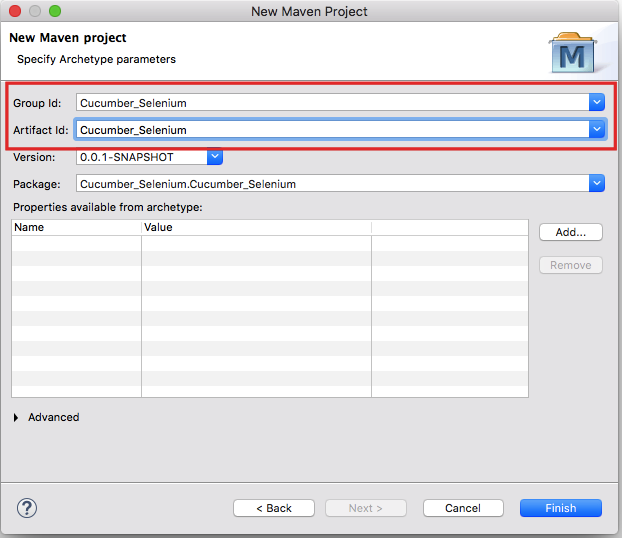 Once you click the Finish button, a Maven project will be created in Eclipse. The structure of the project created in Eclipse will be similar to the following image. 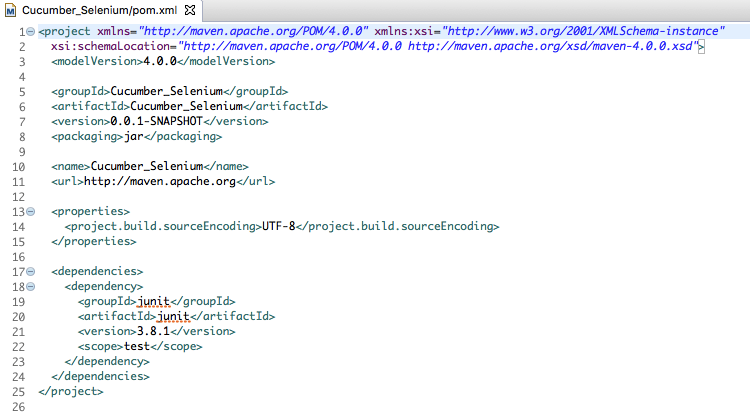 As you can see, there is a pom.xml file created in your Maven project. 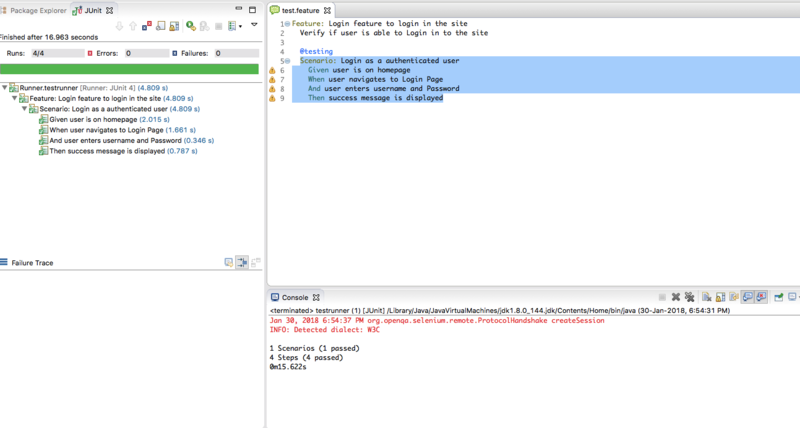 This file consists of the Group ID and Artifact ID you entered, and by default it consists of dependency for JUnit. Refer to the screenshot below. Note: Make sure the versions on Cucumber-java, Cucumber -junit and Cucumber-core are the same, i.e., if you are using Cucumber-java-1.2.5 make sure the versions of the other two dependencies are the same. Step 7: Make sure to update the project after adding dependencies to pom.xml; you can do that by right clicking Project → Maven → Update Project. 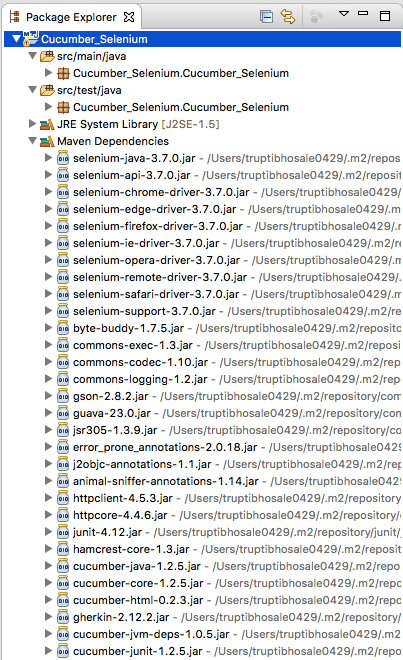 Once you update the project, you will see that many JAR files are added to the Maven Dependencies folder in your project. 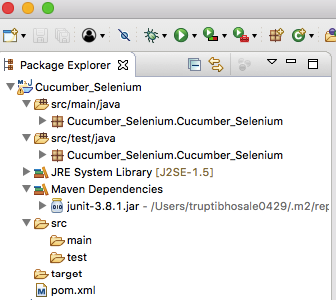 Step 8: To proceed with Cucumber implementation, we need to create three packages to store the feature files, step definition code and testrunner code. Let us create three packages: features, seleniumgluecode and runner. To create a new package in src/test/java, right click the folder → New → Package. Step 9: Now create the feature file in the Features package. Right click → New → File → Enter name test.feature. Note: If you don’t find ‘File’, then click on ‘Others’ and then select the ‘File’ option. Step 10: Create a class test.java to write the gluecode for the features written. Right click seleniumgluecode → New → Class → enter name as test and save. Step 11: To run the feature files and their respective code, we need to write a JUnit runner class. Right click runner → New → Class → enter name as testrunner. The basic structure to write and execute code is ready and you are almost set to write and execute Cucumber scripts. Let us consider a login scenario where the user needs to enter a username and password, and confirm if he can log in. We need to write a basic scenario in the feature file test.feature which we created. The basic scenario to test the login functionality is ready. Now, we need to write the JUnit test runner class in order to execute the feature file. 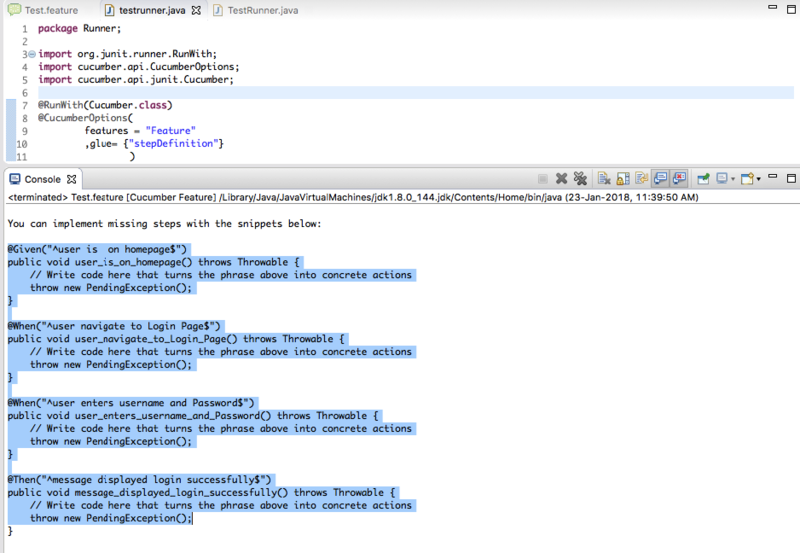 Add the code given below to the testrunner.java class. To execute the code above, right click test.feature file → Run As → Cucumber feature. On executing the test.feature file, you will notice that in the console it mentions the implementation of missing steps. This is because we have not defined the code to execute the steps. To begin writing the glue code for the steps, copy the snippets from the console and paste them into the test.java class which we created under seleniumgluecode package. Once you copy the snippet, remove the “throw new PendingException()” and write appropriate code for the steps. We are almost ready to execute the feature file, but in order to execute the code on Firefox or Chrome we need to add a very small piece of code in the existing code. Follow the steps in the section below to understand the execution of the code on different browsers. In Selenium 3, to execute the code on the Firefox or Chrome browsers, we need to use an external driver. To execute the code on Firefox, we need GeckoDriver. To use this, download Geckdriver.exe to your system, and in the test.java, before initiating the Firefox browser, set the system property as webdriver.gecko.driver. To use Chrome, we need to use ChromeDriver. As with Firefox, here also we need to set the system property as webdriver.chrome.driver. We are all set to execute our first scenario for login functionality on Firefox/Chrome. Add the system property for the desired browser to the function, and then execute the test.feature file, and your browser will open and the login functionality test will be carried out. Imagine that you have to share the test reports with your client and senior management; in that case you will need a shareable HTML report which you can share after executing your tests. You can achieve this by following some very simple steps. Step 1: In your testrunner.java class, add a plugin inside @CucumberOptions to format your test results into the HTML format. In order to set the path for the reports, we have to give a path in the project. To make this easier, the path is target/htmlreports. Step 2: Now save the testrunner.java class and execute it. On execution, you will see that the folder htmlreports is created inside the target folder. Step 3: Access the folder and look for the index.html file; that is the file which contains the test results in HTML format. Step 4: Open the index.html to view the report. The report created would be similar to the image below. We have already seen how to create an HTML test report, but with the help of extent reports we can create more well-organized and detailed reports. Step 1: To implement extent report, we need to add two dependencies to the pom.xml and update the project after adding the dependency. Step 4: On executing the tests, a new folder will be created at the path mentioned in the plugin. Open the folder and open the report.html. The report created will have a heading, graph of the test results, detailed results for all features executed, and you can also filter the test results with the status Pass/Fail by clicking the Status menu. Open the terminal in your system and navigate to your project directory. Since we have already added a Maven dependency through pom.xml, we can execute the test using the simple command mvn test. In case you have a large number of feature files added to your project, and you only want to execute a smoketest.feature file, you can use the command mvn test -Dcucumber.options=”src/test/java/Features/smoketest.feature.